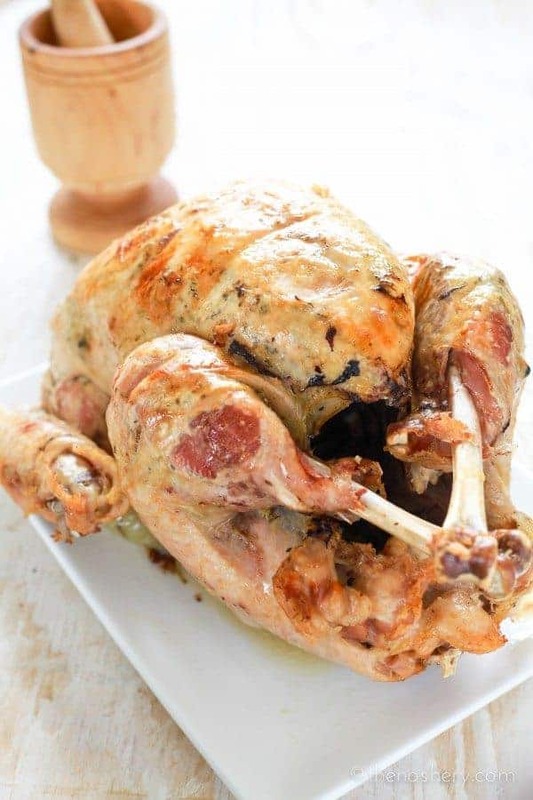 Pavochon | I am going to share my absolute favorite turkey recipe. This is honestly the most delicious and moist turkey ever! Scouts honor! You will be the Thanksgiving turkey queen or king. My technique is a little different, so you’re not going to end up with a golden skin bird, actually, it’s probably going to look a little gnarly, but it will be delicious and succulent. PROMISE!!! I made this same turkey for a catering, and there wasn’t a scrap left. This is how the turkey is done back home in Puerto Rico. It’s called pavochon, pavo meaning turkey and chon from lechon meaning pig because it is seasoned like you would season a roast pig. This bird will change your life. Let start first with the seasoning. In a food processor combine, all the seasoning ingredients amounts are according to the weight of the turkey. You may think, “Really, these many cloves of garlic?” or “This much salt?”, but I promise your bird will be perfectly seasoned. Pulse the processor until the garlic is minced and well combined. 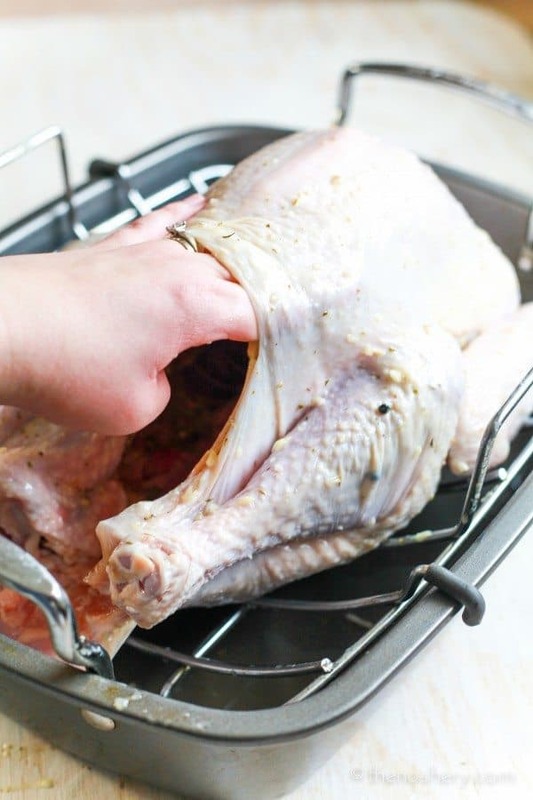 Using your fingers and a small rubber spatula separate the skin from the turkey. Be sure to be gentle, but you want to separate the skin from the breast, legs, and thighs. Using a rubber spatula makes it easier to get to those hard to reach places. Pat the turkey dry with a paper towel. Rub the seasoning under the skin and in the cavity, getting all up in that turkey’s business. 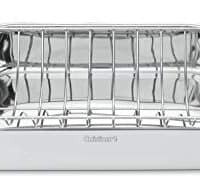 A small rubber spatula will help push the seasoning into those hard to reach places. Tuck the wings back behind the bird. 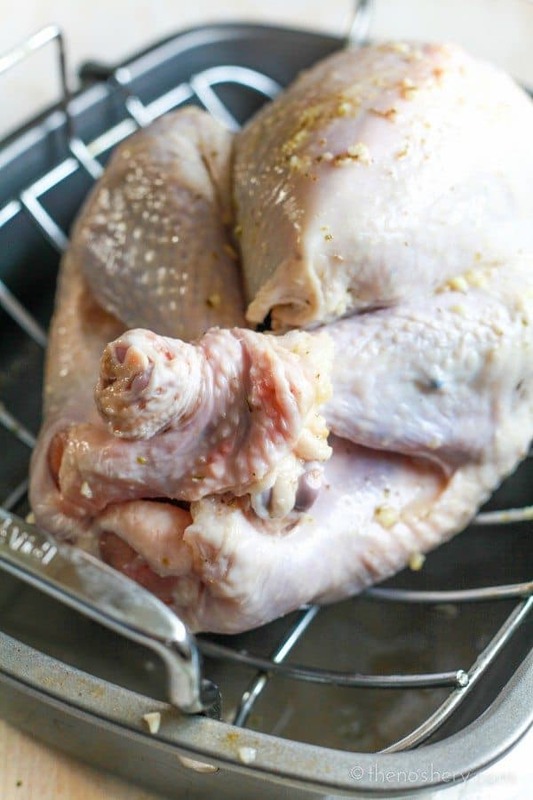 Cut a small slit into each side of the excess skin at the front of the turkey’s cavity. Tuck the legs crossed through the slits. 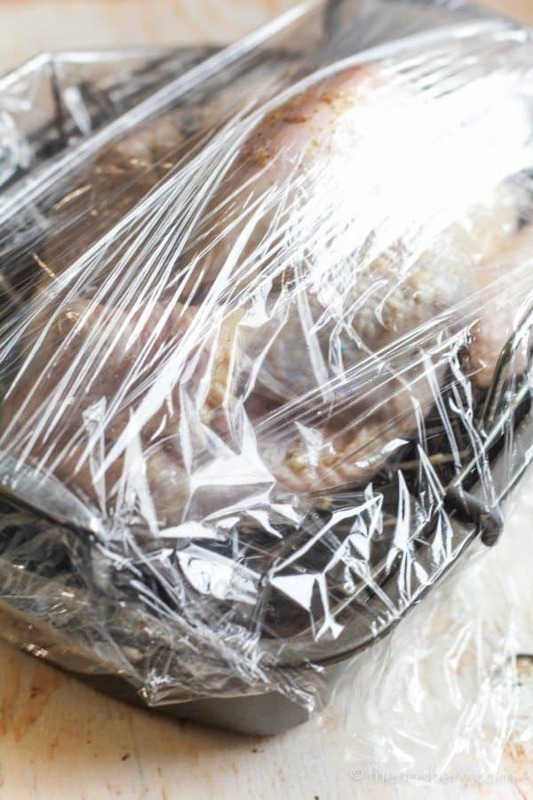 Cover the turkey tightly with plastic wrap and refrigerate overnight. The next day preheat the oven to 325 degrees. This is when it may get a little weird for some people. Flip the bird breast side down using four onion halves to stabilize the bird. It doesn’t have to be perfect, just stable. Pour a 12 oz bottle of beer into the roasting pan. I thought some Shiner Holiday Cheer would be a festive choice but if you have a Medalla go for it. Tightly cover turkey and roasting pan with aluminum foil. Making sure you have a tight seal. Roast in the oven until the temperature is taken at the breast reads 165 degrees (refer to the chart below for approx. times), 30 minutes before it is done uncover and using two kitchen clean towels flip the turkey breast side up, drizzle breast with olive oil and return to oven. When done remove the turkey from the oven and let rest for 10-15 minutes. See, like I said, you don’t end up with a gorgeous golden bird you see in the magazines, but the taste of this bird will knock your socks off. Carve into those big tender, juicy breasts, you know what I mean. I am going, to be honest with you. 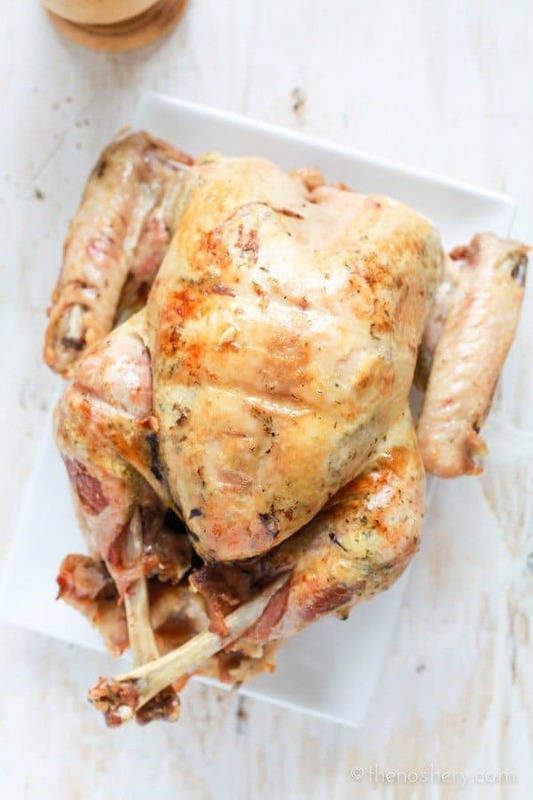 I am strictly a dark meat kind of girl, but because this bird is roasted breast side down and tightly sealed it makes the tender juiciest white meat ever! For this turkey, I cross over to the white meat side. This step is totally up to you, but I highly recommend it. I know the turkey is already juicy, but why put a limit on juicy? You can make gravy out of the dripping, but I like to carve and pick the turkey clean and serve it in the juices. All that turkey goodness sits and marinades to become even more goodness. I know! I didn’t think it was possible either, but IT IS! Honestly, you could almost mistake this bird for pork. And, you all know how much I love pig! The measurements for the seasoning in the recipe below is for 1 pound of turkey, so however much your turkey weighs multiply that by your ingredient amount. So, if your turkey weighs 24 pounds, that is 24 teaspoons of salt, 24 cloves of garlic and so on. If you are wanting to make the ultimate Puerto Rican Thanksgiving spread you need to make some arroz con gandules (Puerto Rican rice and pigeon peas) and pasteles. For dessert, it wouldn’t hurt to make some arroz con dulce. Need more Puerto Rican recipes? Check out my full collection of Puerto Rican recipes! There you have it! My favorite turkey, just like my Mami made it. Because that is how a Puerto Rican does turkey *puff out chest, beating chest* Hoo-rah! You know you want some! This is how Thanksgiving turkey is done in Puerto Rico. It's called pavochon, pavo meaning turkey and chon from lechon meaning pig, because it is seasoned like you would season a roast pig. Rise and clean turkey, removing neck & gizzards, pat dry. 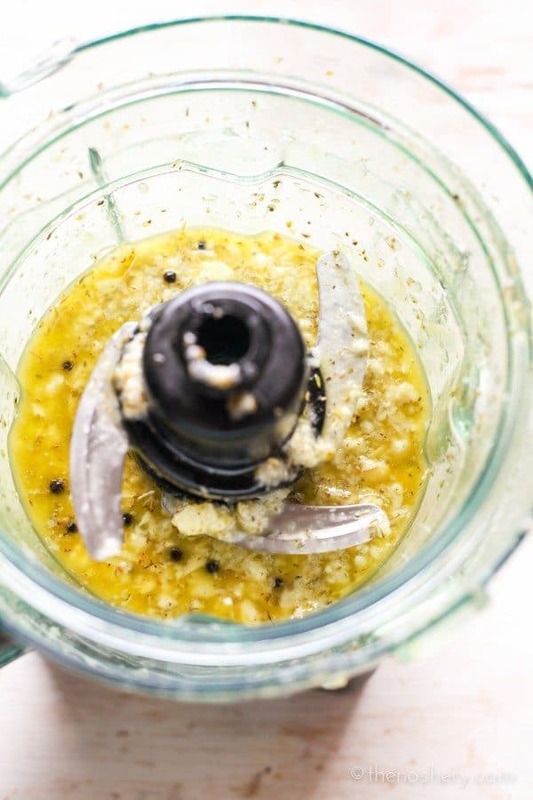 Combine all seasoning ingredients in a food processor, pulse until garlic is minced and well combined. 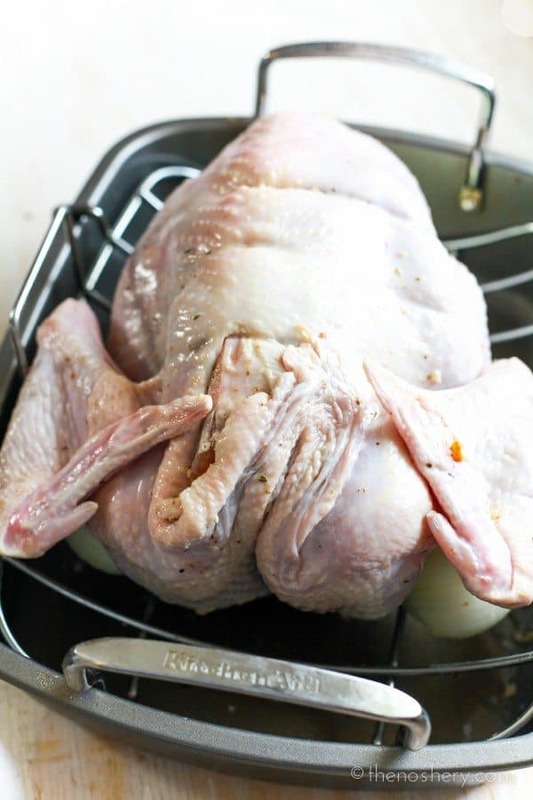 Using your fingers and a rubber spatula gently separate the skin from the breast, legs, and thighs of the turkey. Rub the seasoning under the skin and in the cavity of the turkey. Drizzle the skin of the turkey with olive oil and rub it all over. Tuck the wings back behind the bird. Cut a small slit into each side of the excess skin at the front of the turkey's cavity. Tuck the legs crossed through the slits. 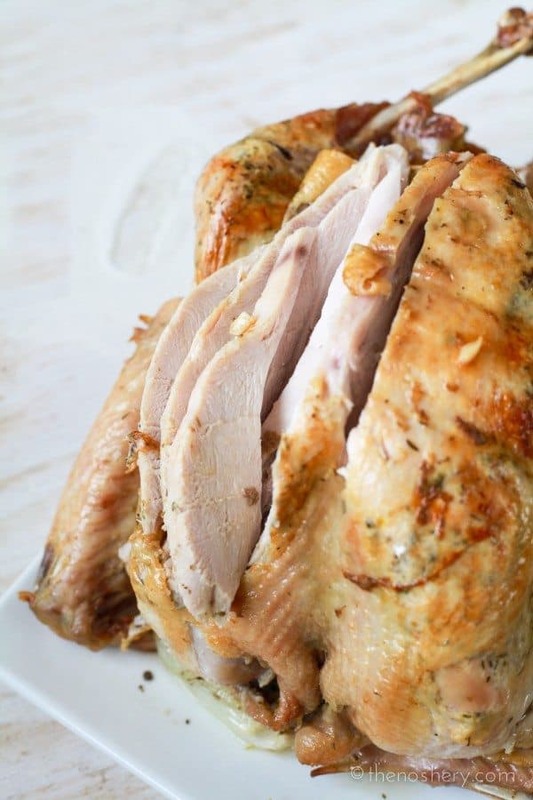 Place turkey in roasting pan, cover with plastic wrap and refrigerate overnight. Remove turkey from the refrigerator and flip the turkey breast side down. Use the onion halves to stabilize the turkey. 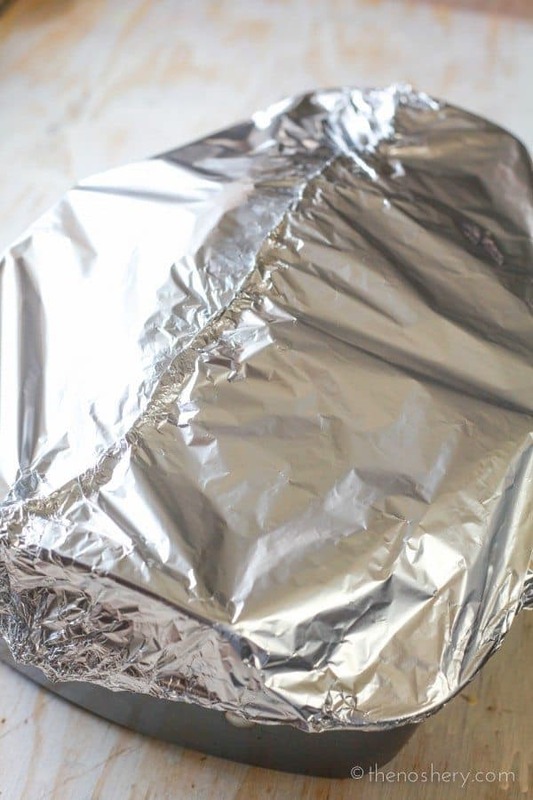 Pour beer into the roasting pan and cover tightly with heavy-duty aluminum foil. Roast in the oven until the temperature is taken at the breast reads 165 degrees (refer to the chart below for approx. time), 30 minutes before it is done uncover, using two clean kitchen towels flip the turkey breast side up, drizzle breast with olive oil and return to oven. Carve and pick the meat off the turkey, return to juices and serve. Multiply seasoning ingredients by pounds of turkey. Reserve turkey neck and giblets pouch for dressing. Allow up to 2 days to defrost the turkey in the refrigerator. This method looks pretty official and having had Pavochon last week, I can say your readers won’t be disappointed! 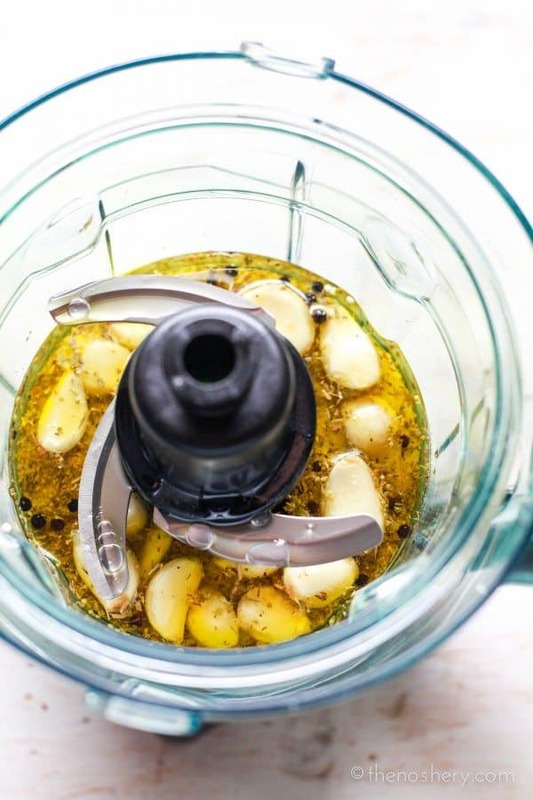 Do you use any cilantro, culantro or ajicito in your marinade? What is 1 pepper corn mean? Is it tsp or tbsp? It means 1 whole peppercorn. The recipe calls for 1 whole peppercorn per pound of turkey. If it’s an 18 lb turkey you need 18 peppercorns. This was everything you said and more! The best turkey I’ve ever had even though I did over cook it a bit and when I went to turn it over it fell apart so I had quite a bone hunt on my hand but oh so worth it. I usually brine my turkey but add garlic, peppercorns to the brine, then I dry the bird and rub it down with the adobo for a short time. I also rub it down with achieve oil to give it a richbolden golden color and cook it on the grill (gas grill with wood chips). So, good! I do not brine the turkey. I simply season it and let it sit with the seasonings overnight. The seasoning resembles a wet rub. One garlic clove? That’s not enough. You mean 1 garlic head? If you read the recipe it says the seasoning if for 1 lb of turkey so take those ingredients and multiply it by the how much your turkey weights. It is written this way to accommodate any turkey. Thank you so much for this recipe! Made it last Thanksgiving and it was a HUGE hit. Getting it ready for this year as well. Happy Holidays to you and yours! ?? I have been making this recipe (minus the beer) for over 20 years. It is THE BEST!! I also add a touch of mustard. Is like eating roasted pork! Yum! I just went to my cousin’s house for Thanksgiving and she made this recipe. Best tasting,flavourful turkey I’ve had in a while. The meat comes our very moist including the breast meat. This recipe is a winner and I’m making it for xmas dinner. What would you recommend as substitude for the beer, a non alcoholic substitute? I have the turkey seasoned and wrapped up ready for tomorrow. I’m so glad this recipe reminded me of pavochon. My new boss abstains from pork and I didn’t want to leave her out of Puerto Rican Christmas lunch! I usually bring some arroz con gandules (easy enough to make kosher and/or vegetarian if you want to), tembleque (sorry vegans, esa es la que hay), guava cheesecake (and/or mantecaditos with guava) and of course, pernil. But I think this year work gets pavochon! Thanks, Meseidy! Thank you so much for this recipe!! I made my turkey early this year and am already enjoying leftovers 🙂 I substituted apples for the onion and Glenlivet for the beer. I love your blog, I just stumbled onto it while searching turkey recipes on pinterest and I’m sure I’ll be frequenting through your recipes in the future. I’m a native Puerto Rican living in Orlando and I’m glad I found a way to reconnect with my people’s food 🙂 keep up the great work! 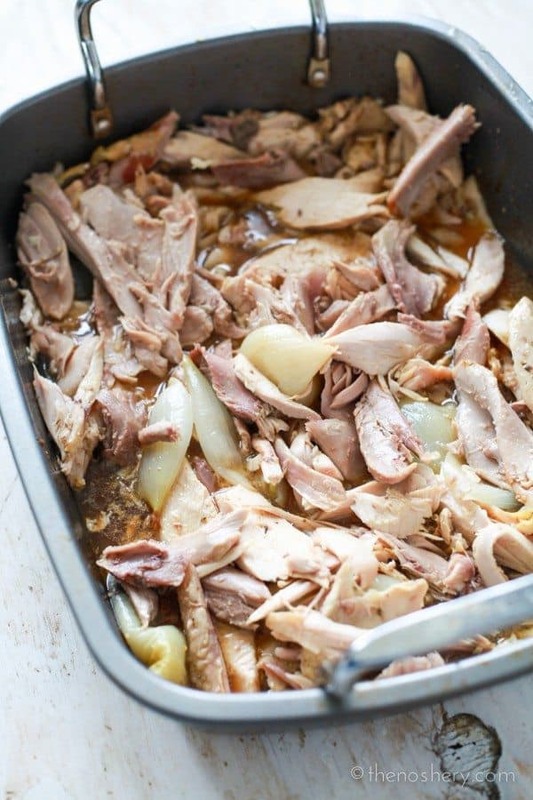 Would this recipe work for a turkey breast in the crockpot? Can I add just a little beer in the crockpot? Yes, it would work great in a crockpot! I am happy to let you know that this will be my second year using this recipe for my thanksgiving turkey! Now I have a question for your concerning your savory bread pudding which i’m dying to try. How many cups of bread cubes would you say is a loaf of bread for this recipe? Also, if i wanted to add ground beef to it would it work and how much ground beef? How many serviings is this recipe for? i will be serving about 10 healthy eaters..
and a healthy dose of humor. Many thanks Meseidy. This sounds PHENOMENAL, Meseidy! LOVE all that garlic!! made this for thanksgiving today, and it was amazing! also, no reason for it to be ugly or sans golden skin — we just removed the foil for the last few minutes after it had been flipped, and got a gorgeous bird! thanks for a great recipe! I am sure it will be wonderful! Have a Happy Thanksgiving! I LOVE YOUR SITE! Love the fact that you’re sharing all these delicious Latin recipes, they totally remind me of home. Thank you so much! I love sharing with you all! Yummy!! 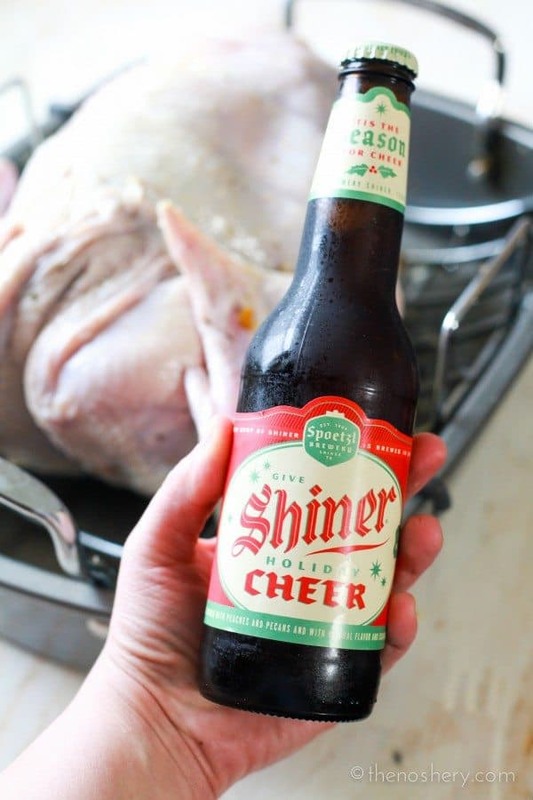 I’ve never done it with the beer but always roast the turkey this way!!! Thanks for my recipe for this year!